As WEALTHTRACK celebrates its tenth anniversary year we have invited some of our regulars back to discuss how much has changed and how much remains the same since 2005. One thing that has changed for everyone is that we are all ten years older, no exceptions! We are ten years closer to retirement, and in some cases our viewers are now in retirement. Another big change over the past decade is that interest rates have plummeted. Short term interest rates have been at or near record lows ever since December of 2008 when the Federal Reserve lowered its key short term interest rate, the Federal Funds Rate to zero percent. Much of the rest of the world has followed by lowering their official lending rates. That has set off a worldwide search for income. Another major shift has occurred in stock prices. The S&P 500 which began WEALTHTRACK’s launch at the 1,222.24 level in July of 2005 peaked in October 9th of 2007, only to suffer its biggest decline since the 1930s, a 57% drop to its March 2009 low during the financial crisis. It’s taken years for the S&P to surpass its old high. According to one of this week’s guests, award-winning financial planner Mark Cortazzo, when you retire and how you invest can mean the difference between a comfortable retirement and a disastrous one. He cites three hypothetical examples. He calls them the “3 Brothers”. They each retire with a million dollars, they each withdraw $60,000 a year, or $5,000 a month, but they retire three years apart. Brother 1 retires in 1997, as the tech bubble was gaining steam. Brother 2 retires in 2000 at the top of the market, just before the tech bubble bursts. Brother 3 retires in 2003 as the credit bubble, that imploded in 2009, was in its infancy. Here’s the scary part. By 2015 there was a wide discrepancy in their investment results and in one scenario the middle brother had almost run out of money. Scenario 1 has them all investing only in the S&P 500. By this year Brother 1 had $1.64 million in his portfolio. Brother 2 had only $63,945 left in his retirement account! And Brother 3 had $1.65 million. Scenario 2 has them all investing their million dollars in a diversified stock portfolio, evenly divided among five different asset classes. The results were quite different and much improved. By this year, brother 1 would have doubled his money to nearly $2 million. Brother 2’s portfolio would have $1million, what he began with, even after the annual $60,000 withdrawals. Brother 3 would have $2.4 million. What are the lessons to be learned from these outcomes? This week’s guests will tell us. We’ll be joined by Mark Cortazzo, a Certified Financial Planner, Founder and Senior Partner of Macro Consulting Group, an independent financial planning firm established in 1992. Cortazzo was recently named to the Barron’s Top Advisor List for the 7th consecutive year, one of his many recognitions. We’ll discuss why there was such a huge and frightening discrepancy among the “3 Brothers” portfolio results and how we can avoid a similar fate. 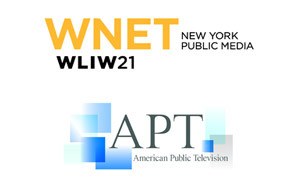 If you miss the show on Public Television this week, you can watch it at your convenience on our website. You’ll also find an EXTRA interview with Mary Beth Franklin about why she has chosen to focus on helping individuals maximize their Social Security benefits. 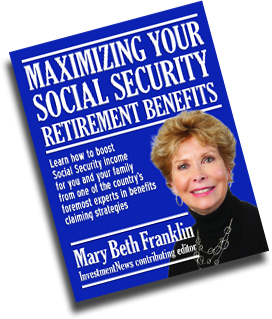 You can also purchase a copy of Franklin’s ebook, “Maximizing Your Social Security Benefits”, here. 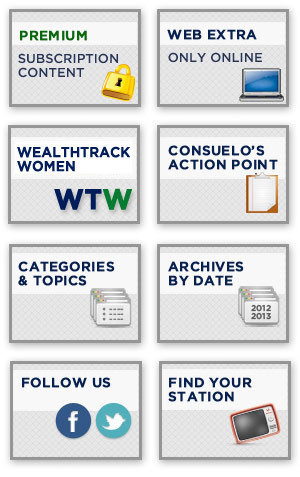 Additional appearances from Mark Cortazzo & Mary Beth Franklin from the WEALTHTRACK archives.